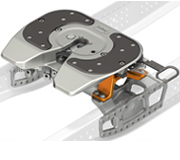 SAF-HOLLAND developed the first 14t frame-integrated fifth wheel in close cooperation with Mercedes-Benz Trucks. With coupling plates from Georg Fischer made from spheroidal graphite cast iron, it offers a complete solution for Mercedes-Benz Actros and Antos that is both weightoptimised and load-optimised. 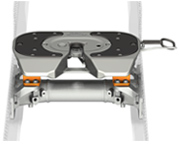 The frame-integrated fifth wheel is found directly in the vehicle frame and is tuned optimally to the tractor unit, meaning it achieves a significantly higher payload potential compared to similar products.